OK, so my last "shooter" was a fun but time consuming project. 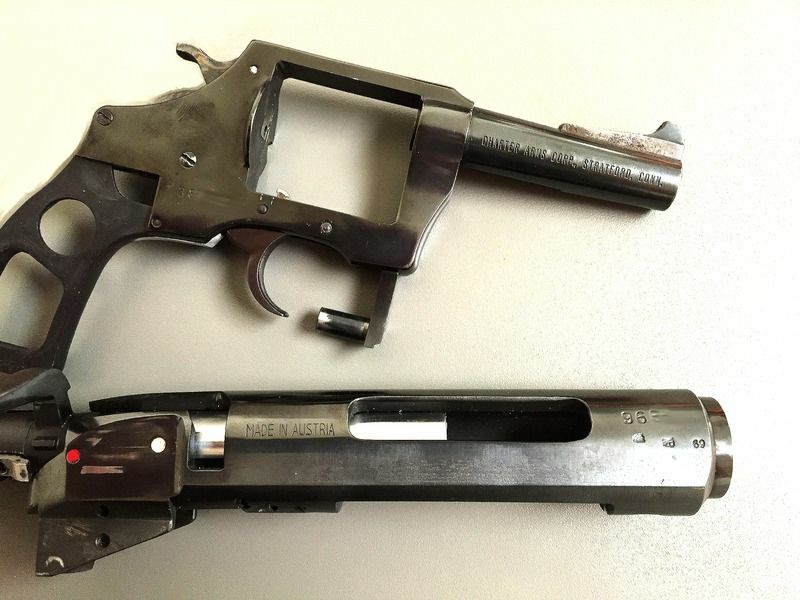 With much help from Rich Coyle I was safely able to assemble a Bladerunner Blaster using a real Charter Arms .44 special Bulldog that I kept in firing condition. AGAIN, kids do not do this at home, we are "trained professionals." Seriously, I have been a licensed firearms dealer and maker for over 25 years and a police and civilian firearms instructor for about the same amount of time. My machinist and I (legally) build semi auto guns out of blocks (billets) of metal. This is not something that you can do with a drill and a Dremel. Yes, I am building a second shooter but this time I'll be using a Steyr SL receiver and bolt assembly from the correct model .222 rifle instead of an RAC replica receiver. Since the Steyr is hard, gunmetal and needs extensive milling and drilling and tapping and countersinking, etc. it's going to be a slow, careful process. We've even gone so far as to 3D print some vice jaw covers to protect the pieces. 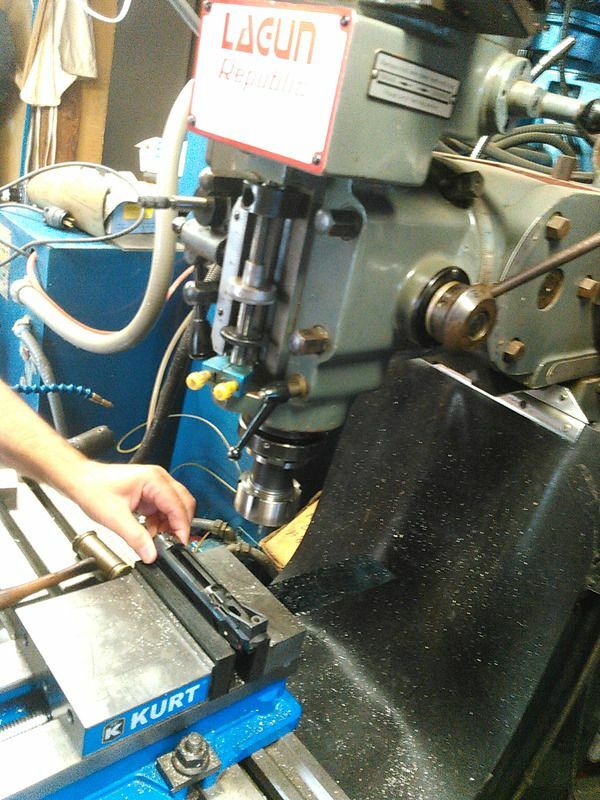 We're using an industrial Lagun mill with a Kurt vice, CNC lathes, etc. The first shooter we built turned out great because once we got the Bulldog configured properly Rich Coyle fitted one of his newest uppers to it and it looked beautiful. The Bulldog functioned perfectly. This will be more of a challenge. This is far from the first Bulldog/Steyr replica as others have already done this. I'll post pics as we progress. Can't wait to see this unfold. Now this is something to look forward to! The problem with milling off metal is that once removed ... gone forever. So we will be making multiple passes, taking off a LITTLE metal at a time. What are you going to do for the Side covers? Are they going to be aluminum? 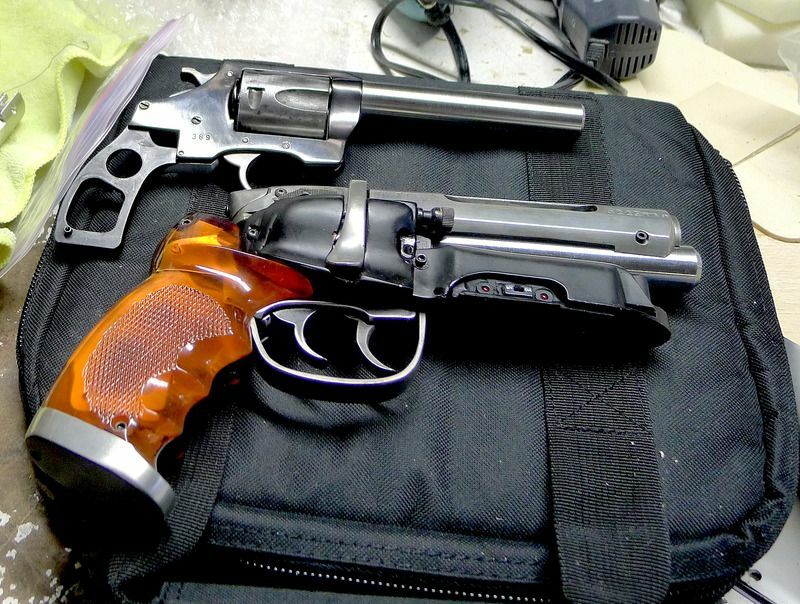 Very curious as to how you will fabricate these. Hence my reliance on my shooting buddy who is a master machinist. I don't even know how to turn that thing on! I may use two sets, one out of thin aluminum for display and a separate set for shooting to accommodate heat and gas from the flash gap. Undecided at this point. Here is the close to finished Bulldog. Added the new barrel, made out of rifled barrel stock which was cut, turned, crowned, and threaded. The proper torque, lede, and flashgap applied. I still need to bob the hammer. Below it is my first shooter. Built on another Charter Arms Bulldog but using a Coyle replica Steyr upper. 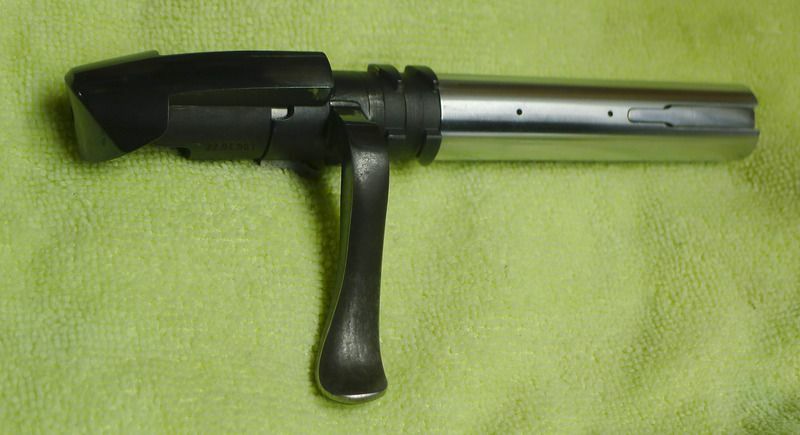 Here is a photo of the complete Steyr SL .222 short action bolt. Pretty much the original plans called for only using the end cap and the lever but there MAY be a way to save it. We'll see. Let's see if we survive and are successful with mine! This MAY be so time consuming that the shop hours billing may be very, very high. Luckily, for me, he and I are long time friends and we've built real guns together. For a commission job it might be costly. I did tell him to keep track of the process just in case he wants to do more on a commission basis. We are going slow on mine as it is all unchartered waters to us. We have had a lot of guidance from Rich Coyle and even Adam Savage gave me some hints. We think that if we get mine done properly, any subsequent builds will be faster and easier and if we have to 3D print a filler piece to keep the receiver stable in the vice it can be used again. Pro-Job for sure on that piece for sure...eager to see the rest! Warning for do-it-yourselfers ... the steel that they use for the Steyr is hardened, VERY hardened high grade steel. Even with a giant, industrial mill the cuts are slow going, measured in thousandths of an inch per pass. The front of the receiver took almost 4 hours to open up and that was the easy end of the receiver, the back end requires much more complex cutting and shaping. At least the front end is done. The machinist said we might need to get a specialized cutter to make life easier. We would normally have a completed AR15 / AR10 receiver done by now, starting with a billet (block) of aluminum.